Within "Dig Me Out" is an indie rock gem that only maintains it's wonderful shine with age. I picked this record up in Boston while I was on tour in 1997. It was new, exciting and catchy. I think there are two aspects to this record that grabbed me. The first being the guitar work. With the lack of bass player there is a challenge to this band to keep things full sounding but not sacrifice musical competence by just having one guitar ride a root note. 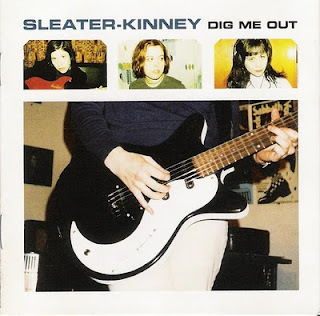 Sleater Kinney manages to intermingle their guitar parts in a way that creates texture and melody while filling the entire canvas. The second characteristic here is the vocals. There's a powerful lead vocal hear that is very distinct and commanding. The second,"backup", vocal has a "matter of fact" speaking tone to it that contrasts the almost operatic lead vocal. The parts where these two intermingle work very well. It's almost like the guitar and vocals take on that same duty of swirling together with a great result. The band can engage in their upbeat songs like "Dig Me Out", "The Drama You've Been Craving" or "Dance Song 97'" and have the dance floor moving. There's a pop sensibility here in the verse/chorus song structure, however maintains it's raw and authentic sound. The band also has the ability to write some beautiful, introspective sounding songs like "Buy Her Candy" and "Jenny", where the slowness can't help but create a thought-provoking composition of music and lyrics.